Mr James Scullin MP and Mr Arthur Blakeley MP, Minister for Home Affairs. 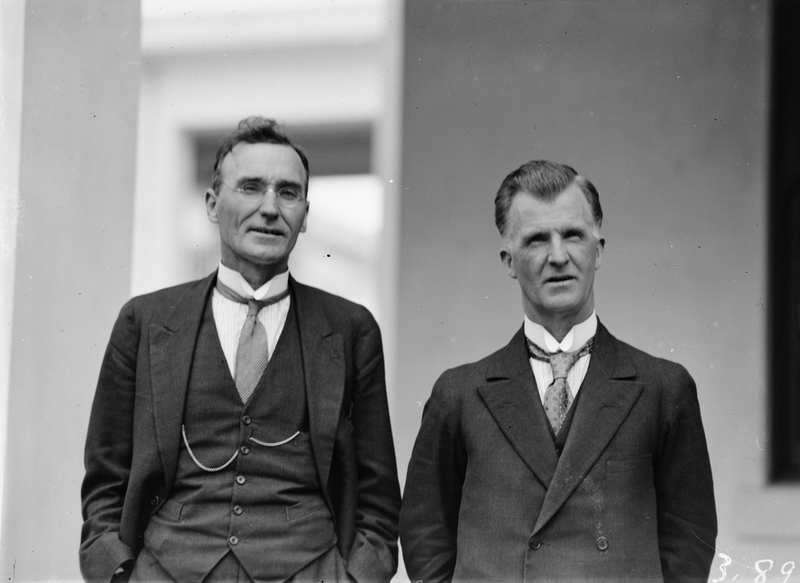 Arthur Blakeley (on the left) was Scullin's Minister for the Interior. Blakeley came from Broken Hill and was a staunch unionist. A period of austerity ( dont we know about them?) was about to descend on Canberra. Of anecdotal interest: Blakeley's brother, Fred, led the party to find Lasseter's reef , with Lasseter, who became lost and was never seen again. Fred wrote two books and make good reading; Hard Liberty is about his bike ride to Darwin in 1908, and Dream Millions is about gold in Australia. Lasseter worked in Canberra for a few years and lived at Russell Hill and also at the workers camp at the northern end of Lonsdale St.
Arthur lived at 8 Mugga Way. Finally, Fred did ask Arthur to help with official finance to find the reef....Athur properly declined to assist!